Smaller knives evolved in the early 18th century as cutlery became specialised. A desire to eat more elegantly prompted the need for table equipment that could be used only at particular times in the meal or with certain foods. The fruit or dessert knife was designed for use with the last course or dessert, which might consist of fresh or candied fruit. A Victorian etiquette book of 1880 advised, 'In eating pears or apples, they would be peeled and cut into halves and quarters with a fruit knife and fork.' These knives could also be used to cut cheese or cake. Dessert cutlery had always been more highly decorated than that for the earlier courses, to reflect the status and expense of the dessert. Handles, in particular, were often more ornate. 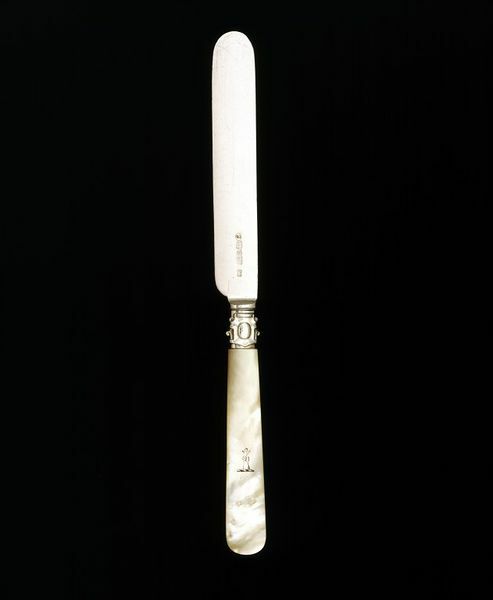 This knife has a handle made of mother-of-pearl (the most expensive material used for such purposes), which adds to the effect of luxury. In the Victorian period fruit knives were commonly sold with fruit forks in boxed sets of a dozen. The manufacturer Elkington & Co. could charge up to œ22 a set in 1885 for richly engraved blades with carved handles and accompanying matching forks. Marked on the blade G, SAV above ORY, a symbol of a downpointing triangle with a cross above, LON above DON and PS all in individual shaped lozanges.